A highlight in my life next to birth of my children..Meeting my favorite band. My youngest son, Randy who was in the military at the time, surprised me with Meet & Greet tickets to the Philadelphia show for my birthday.I had a few days to have something for Accept to sign. I was sooo excited, .I know I drove my family insane trying to figure the right thing to bring.. I wanted something different and personal..sooo the night before I took my leather jacket and to my best artistic ability, painted one of my favorite Accept icons..Double flying ‘V’s..I even had the luck of having them sign my leather a 2nd time…From the first time I seen them in 1984, I knew then I had to get me a Flying V and Rock On. 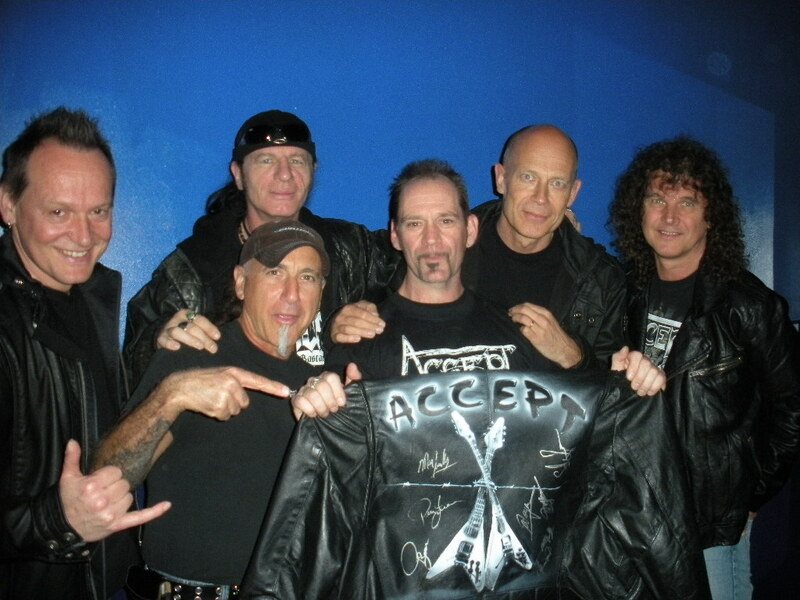 Accept has been there in my life through the lows and highs.Never straying from their true musical values. That in itself says alot about the band and life in general. Be true to who you are..Accept yourself and others will Accept you for who you are..